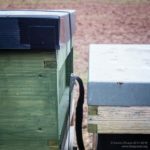 What does the hive roof do? I’ve built a number of roofs from Correx (the sort of twinwall, extruded, fluted polypropylene used to make estate agent signs) which work pretty well. 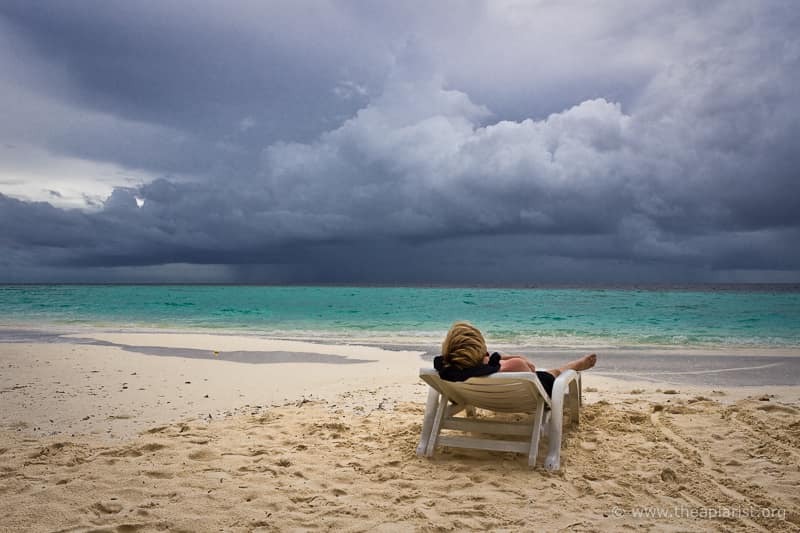 They are very lightweight, totally weatherproof, easy to build and incredibly inexpensive. Their weight means they either need a brick added on top, or – better – a strap around the hive and stand. They’re not structurally robust, so you can’t stack supers on top of them. 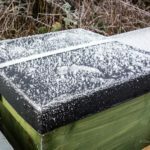 However, there are ways around this – use a spare hive stand or a standard roof from an adjacent hive in the same apiary. Correx roofs provide no insulation, but a standard roof doesn’t really either. In the summer this shouldn’t be an issue. However, I use insulated crownboards containing a 50mm thick block of Kingspan. These are used all year round and ensure little heat loss during even the coldest weather. Correx (which is a trade name and used generically … any equivalent twinwall, fluted, extruded polypropylene will do) is available online or can be scavenged from election posters or estate agents signs. 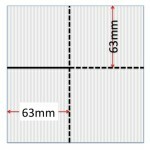 Five 2.4 x 1.2m sheets of 4mm Correx should cost less than £50 (delivered … try thealuminiumshop on eBay for example), with each sheet being big enough to make 8 roofs. That’s about £1.50 a roof … what a bargain. National roofs are square. A 60 cm2 piece of 4mm Correx makes a National roof with an ‘edge’ about 6cm deep. If you want a deeper ‘edge’ you’ll need a larger sheet, which means you can’t cut two width-wise from a 1.2m wide sheet of Correx. 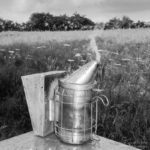 If you use Langstroth or some other hive type you’re on your own as far as measurements are concerned. For a National roof the relevant measurement is ~63mm from the edge for the fold. You need to crease the Correx so you can fold it along the crease, and then make four cuts, one at each corner, to allow the corner to be folded over and stuck on place. When cutting the Correx remove a 4-5mm sliver as shown in the ‘Corner detail’ image below. This makes the corner fold more neatly. To ‘crease’ the Correx and make it easier to fold you need to use a pizza cutter. When using it with the grain don’t press too hard or you’ll cut right through the Correx. 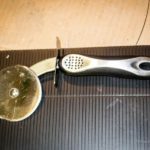 When going across the grain (as shown in the ‘Pizza cutter’ image below) you’ll need to use quite a bit more force to compress the ribs and allow the Correx to fold easily along the crease. Once creased, simply fold along the crease … this is made easier if you line the crease up with a right-angled edge and fold along it. It’s more easily done than described, so practice on offcuts. Most glue doesn’t work on Correx. The stuff is coated with some sort of chemical which makes water – and therefore most liquid glue – bead and stick poorly. 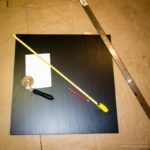 There are ways of flaming the surface with a blowtorch to allow some glues to work – more details, including a range of glues that might work, are available online. 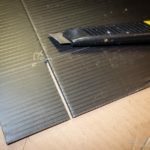 My advice is don’t bother – none of the glues I tested (Gorilla, EvoStick or cheapo stuff from a glue gun) worked for more than a day or two. 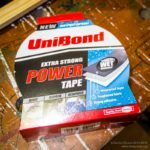 Instead use Unibond waterproof POWER tape. This is readily available, relatively inexpensive and works. Two small pieces across each corner are sufficient. Look at the ‘No overhang’ image below to see how to use them. To make them stick even better to the Correx slightly roughen the surface using fine grade sandpaper. I’ve been using these roofs all winter, both on hives and stacks of stored supers. All look as good now as they did when they were built (or as bad … depending on your viewpoint). Water still beads on them and the bees have done just fine. All the taped corners have held securely. I also secured some with zip ties at the corners and these have fared less well. Just use tape. 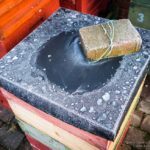 They’ve yet to be subjected to hot weather or prolonged periods of sunshine (which might soften or degrade the tape) but appear unaffected by long periods of heavy rain or repeated freezing/thawing. You can get Correx in a range of colours so could even choose something inconspicuous and make the hives invisible from the air. Queen marking pens work well on them if you’re the type of beekeeper who writes notes on the hive roof. Used upside-down these should also make a perfect ‘tray’ to stack supers in when transporting them, or during extraction, preventing propolis and honey getting on the car or carpet. Correx does compress, but is regularly used as a floor covering during building construction, so should be able to take a fair amount of wear and tear. Unlike an upturned metal roof they won’t scratch the floor or rip the car upholstery. As already mentioned you need to use a hive strap or brick to hold the roof in place. You can’t stack supers on an upturned Correx roof … at least, not without trashing them. This entry was posted in Beekeeping, DIY, Roofs and tagged Correx, DIY, roof on April 3, 2015 by David. Will share this in the next Ealing association newsletter. Estate agent’s boards also make good varroa monitoring trays. … and landing boards, temporary floors, crownboards, small hive beetle traps, entrance reducers etc.